I've added real life events to place in context. The fictional events will be in bold blue. ":My mother said to me, 'If you are a soldier, you will become a general. If you are a monk, you will become The Pope.' Instead, I was a painter, and became Picasso. October 25, 1881--Birth of Pablo Picasso. 1881 to 1973--SURVIVING PICASSO--The life of Pablo Picasso. 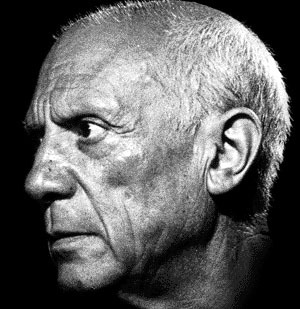 Other on-screen appearances of Picasso portrayed by various actors can be found here. 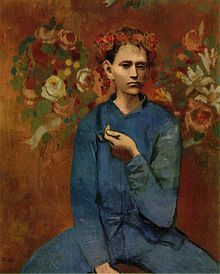 Before 1890--Picasso's father had begun training him. 1891--Picasso moves to A Coruña. 1894--his career as a painter can be said to have begun. 1895--Picasso is traumatized by the death of his sister. 1897--his realism became tinged with Symbolist influence, in a series of landscape paintings rendered in non-naturalistic violet and green tones. 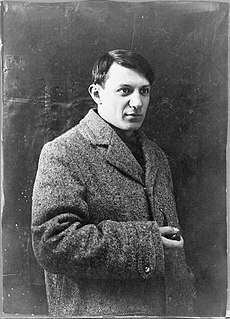 1898--Picasso sets off on his own for the first time to study abroad. 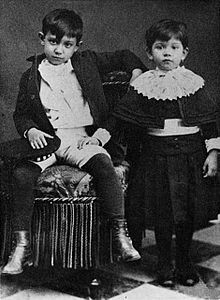 1900--Picasso first travels to Paris. January to May 1901--Picasso is in Madrid. March 31, 1901--The first issue of Picasso's magazine, Arte Joven, is published. October 8, 1904--PICASSO AT THE LAPIN AGILE--Picasso meets Albert Einstein. 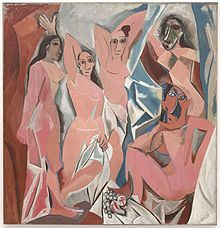 1905--Picasso became a favorite of American art collectors Leo and Gertrude Stein. 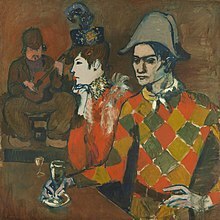 1907--Picasso joined an art gallery that had recently been opened in Paris by Daniel-Henry Kahnweiler. September 1908--YOUNG INDIANA JONES CHRONICLES--"Paris, September 1908"--Young Indy meets Picasso. Tarzan will meet Picasso the next year. 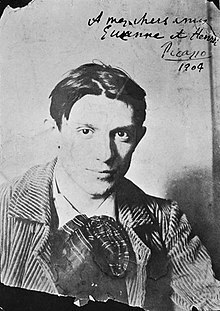 1911--In Paris, Picasso entertained a distinguished coterie of friends in the Montmartre and Montparnasse quarters, including André Breton, poet Guillaume Apollinaire, writer Alfred Jarry, and Gertrude Stein. Apollinaire was arrested on suspicion of stealing the Mona Lisa from the Louvre in 1911. Apollinaire pointed to his friend Picasso, who was also brought in for questioning, but both were later exonerated. August 1914--World War I begins. 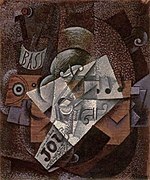 1915--Death of Picasso's lover, Eva. Spring 1916--Apollinaire returned from the front wounded. They renewed their friendship, but Picasso began to frequent new social circles. February 1917--Picasso visits Italy for the first time. Summer 1918--Picasso married Olga Khokhlova, a ballerina with Sergei Diaghilev's troupe, for whom Picasso was designing a ballet, Erik Satie's Parade, in Rome; they spent their honeymoon near Biarritz in the villa of glamorous Chilean art patron Eugenia Errázuriz. February 4, 1921--Birth of Picasso's son, Paulo. 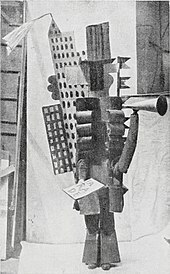 1925--the Surrealist writer and poet André Breton declared Picasso as 'one of ours' in his articleLe Surréalisme et la peinture, published in Révolution surréaliste. 1927--Picasso met 17-year-old Marie-Thérèse Walter and began a secret affair with her. September 5, 1935--Birth of Picasso's daughter, Maya. 1937--Outbreak of the Spanish Civil War. 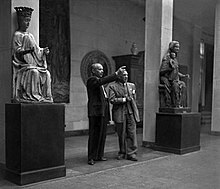 1939 to 1940--the Museum of Modern Art in New York City, under its director Alfred Barr, a Picasso enthusiast, held a major retrospective of Picasso's principal works until that time. This exhibition lionized the artist, brought into full public view in America the scope of his artistry, and resulted in a reinterpretation of his work by contemporary art historians and scholars. 1944--after the liberation of Paris, Picasso, then 63 years old, began a romantic relationship with a young art student named Françoise Gilot. 1944--Picasso joins the French Communist Party. May 15, 1947--Birth of Picasso's son, Claude. April 19, 1949--Birth of Picasso's daughter, Paloma. 1950--Picasso receives the Stalin Peace Prize. 1951--Picasso had a six-week affair with Geneviève Laporte, who was four years younger than Gilot. 1955--he helped make the film Le Mystère Picasso (The Mystery of Picasso) directed by Henri-Georges Clouzot. 1961--By his 70s, many paintings, ink drawings and prints have as their theme an old, grotesque dwarf as the doting lover of a beautiful young model. Jacqueline Roque (1927–1986) worked at the Madoura Pottery in Vallauris on the French Riviera, where Picasso made and painted ceramics. She became his lover, and then his second wife in 1961. The two were together for the remainder of Picasso's life. 1962--Picasso receives the Lenin Peace Prize. 1968 to 1971--he produced a torrent of paintings and hundreds of copperplate etchings. 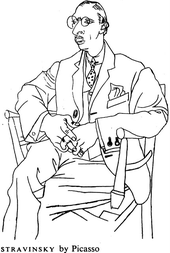 Late in Picasso's Life--SATURDAY NIGHT LIVE--"Portrait of the Artist: Pablo Picasso"--Picasso is giving out free autographs at a cafe. Watch here. April 8, 1973--Death of Pablo Picasso. June 5, 1975--Death of Paulo. 1981--Guernica was on display in New York's Museum of Modern Art for many years. In 1981, it was returned to Spain and was on exhibit at the Casón del Buen Retiro. 1992--Guernica was put on display in Madrid's Reina Sofía Museum when it opened. 2013--EPIC RAP BATTLES OF HISTORY--"Bob Ross vs Pablo Picasso"--Picasso comes down from Heaven again to do a rap battle with Bob Ross, or maybe they are pulled from time. I'm not sure exactly how the premise of this YouTube series works. CARTOON UNIVERSE--The toon counterpart of Picasso discovers his talent while playing Pictionary with the Warners as seen on ANIMANIACS. He also appeared in TINY TOON ADVENTURES. NOT ANOTHER SPOOF MOVIE UNIVERSE--Setting for the events of THE ADVENTURES OF PICASSO. I don't know how to place the song and music video for Prince Charming by Adam and the Ants. It features a male version of Cinderella, who later transforms into the Man with No Name (from THE GOOD, THE BAD AND THE UGLY), ALICE COOPER, Sheik Ahmed Ben Hassan (from THE SHIEK), Vito Corleone (THE GODFATHER), and the Dandy Highwayman (from STAND AND DELIVER). Also, in the song, this Cinderella claims to have seen Picasso visiting the PLANET OF THE APES. HISTORICAL DATA TAKEN FROM WIKIPEDIA, SO IT MUST BE TRUE.